This past weekend I traveled to Ohio for a wedding and I had to travel there by myself. I looked at the typical option of flying, but it's fairly expensive and you get all the joys of long layovers, cramped seats, and relatively high prices. In true Top Gear fashion, I decided I'd look into a rental car to see if I could make the experience more enjoyable and maybe even save some money. Economy rental cars can be pretty horrible and lacking in power. It's always hit or miss on what you'll actually end up with. 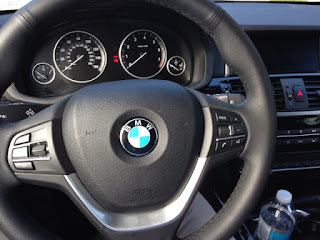 After a little searching, and an SCCA member discount, Alamo provided me with the answer; a one way, one day luxury car rental that would cost less than a one way plane ticket even with the cost of fuel. Sold! 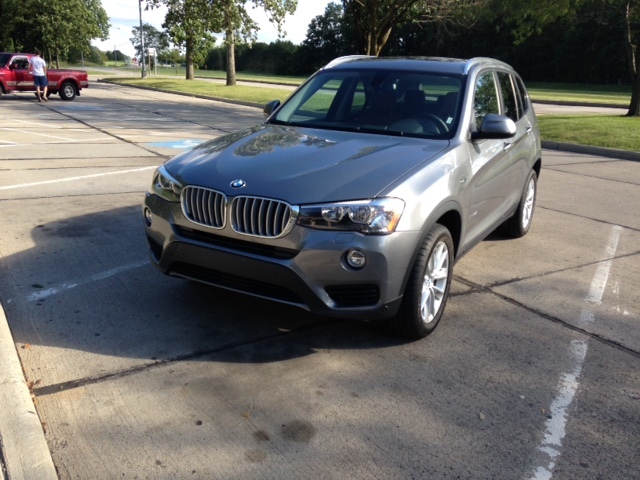 The X3 is the middle sized SUV by the Bavarian auto maker. This version sported the turbo-charged 4 cylinder gas engine putting power down through an automatic transmission and all wheel drive. I didn't dig too deep into all the technical specs and instead just drove the car for 11 hours straight from Columbia, SC to Toledo, OH. Right away I enjoyed the supportive leather seats and significantly quieter cabin than your average car. The infotainment system took about 30 minutes to really get a feel for, but by the end of the trip it was straight-forward and easy to use. The audio quality blew away every other stereo I've listened to in a car (in my limited experience) and helped make the miles fly by. The engine provided enough power to get through traffic and hold a steady pace through the mountains in West Virginia, but I felt it was lacking as much as I'd really like to have if I were buying it. Using Sport mode, the throttle response and shift points improved, but still didn't quite give me all the punch I wanted. Comfort mode was a pretty good all around mode for the average person's daily driving but just wasn't giving me enough power. Eco mode seemed to mostly resist throttle input to force you to accelerate slower and save gas and was unbearably painful after 2 minutes. That's all I have to say about that. Overall the chassis soaked up the bumps better than average cars and the steering had a good feel. The car responded really well in the twisty mountain roads. The only real negatives I found with the car were the engine automatically turning off at every stop. It was a little more sluggish to fire back up as I would have liked. Also the car seemed to have some regenerative braking that always slowed the car down as soon as you left off the throttle. It was great for coasting down a mountain, but in traffic it just resulted in too much maintenance throttle to creep through rush hour in Columbus. In the end, the X3 was definitely the best rental car I've ever had. The trip was way more comfortable than any other time I've made the trip. The average MPG of 26 was a little lower than I'd want. 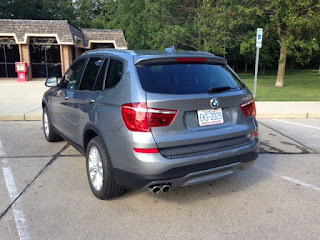 The all wheel drive and large, heavy SUV body seems to be just too much for the little 4 cylinder.